The Zoning Board of Appeals heard a developer’s concept for a mixed-use project in Southborough’s Downtown Business Village this week. Uncertain about proper process, the board ultimately continued the hearing to September 19th. Although the project was strongly supported by the Economic Development Committee, close neighbors raised some worries. Still the board’s main concern Wednesday night wasn’t the project’s value. Members were unsure if the project was properly theirs to rule on. At issue is language related to proposed upstairs apartments in the 2 ½ story project. Members agreed with developer Peter Bemis that they have the right to issue a mixed-use permit as long as all uses are permitted in the zone by right. But the board also agreed with speakers urging them to ensure they follow the correct process. Chair Craig Nicholson said that he will seek clarification from Town Counsel on the main debated issue. That was the claim that the apartments are covered by zoning for “non-transient hotels”. Bemis pitched that the apartment lodging is covered by Southborough’s zoning code. A resident who helped strip the ZBA of its ability to grant Use Variances disagreed. Freddie Gillespie indicated that Bemis had been “led down the wrong path”. She argued that the village’s zoning only allows for accessory and historical adaptive use apartments. Neither of those apply to new developments. She reminded the board of the Citizen’s Petition Article she successfully led to remove Use Variances. She said that the board can’t undermine zoning laws determined by Town Meeting voters. Even if the project is a good one, Town Meeting needs the ultimate say. Robidoux claimed the proposed units qualify. He said that it’s no different than some hotels on Route 9. He told the board no one vacations next to Owen O’Leary’s, they live there long term. The application and supporting documents make no mention of hotels. They instead refer to apartments, residential housing, and four 1-bedroom residential units. ZBA member Debbie DeMuria told fellow members she’d like to see the application corrected to change the 2nd use as hotel. As for the concept of the proposed project, there was mixed reception. Some commenters were enthusiastic advocates for revitalizing downtown. Others were abutters worried about potential negatives in changing the area’s look, adding traffic, and impacting drainage. Commenters in favor were members of the Economic Development Committee, Main Street resident David Parry, and (via letter) Main Street Bank. Parry, who lives further west downtown has long lobbied for improvements to the downtown area. Connelly revisited the comment podium after Gillespie referred to past EDC discussions about the need to bring mixed-use zoning to Town Meeting. She qualified that the committee wasn’t sure if the ZBA permit was the correct process. They were just speaking in favor of the proposed project, not how it should be approved. On the other side were nearby property owners on East Main, Newton and Main streets who wanted more information. 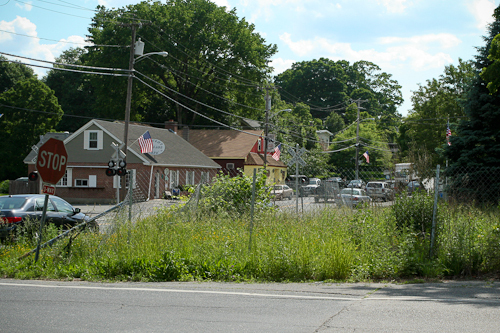 The project site is at the corner of Route 30 and Newton Street, close to residential areas. Newton Street’s Paul Neavyn said that he’s among those who would like to see something better developed at the corner. But he’s worried that an inappropriate project will be approved just because people are tired of looking at the overgrown lot. Between the medical center and proximity to Main Street, Neavyn said the street already has too many speeding cars. Using a radar gun, he and his son clocked cars going 65 mph. He worried about the impact of adding up to 8 residents and multiple unknown businesses with a 22 space parking lot. Bemis countered that he thinks the project will calm traffic by obstructing the corner view. He posited that drivers bypass the stop signs because of the clear view. He also suggested that the Town could add a fourth stop sign to improve safety. Though, he acknowledged that would increase traffic at the intersection. The developer said he didn’t invest in a traffic study. Given how busy the intersection is, he assured it was impossible for his project to cross the 10% traffic increase threshhold. Owners of a nearby business registered concerns. Steve and Sean Mauro of Mauro’s Village Cafe worried about the impact of adding a 2 1/2 story project. Sean wondered if it would open up downtown to “going up”. Would the restaurant and others be allowed to add a second floor for motels? The Mauros and others also spoke of water and drainage issues in the area. They wondered about the impact the project would have. Steve Mauro said he witnessed the DPW dropping a sump pump into an adjacent manhole two months ago to dump water down the street. He referred to water that sometimes runs like a river down the railroad tracks abutting his property. In response to concerns about the look, Bemis pitched that this was the best viable project for the area. He said that based on area vacancies, an office building wouldn’t work. 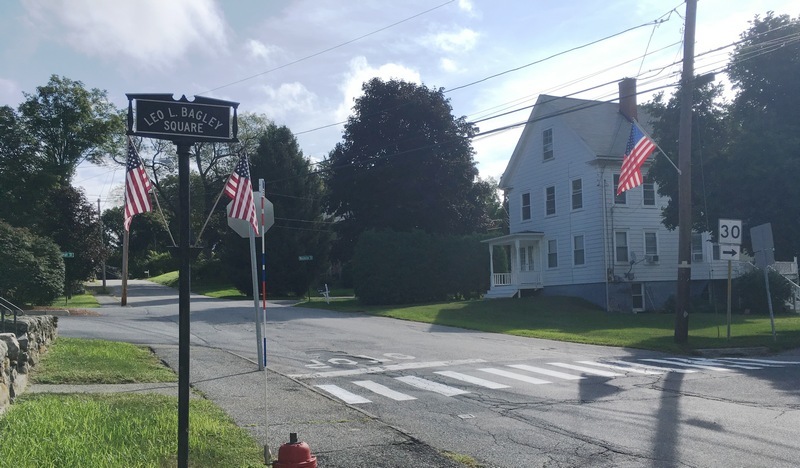 The Southborough resident said he could have used the corner for “a franchise” but didn’t want to do that. Some on the ZBA echoed comments of project supporters. Andrew Dennington said he’s been waiting for a project like this at the corner for years. Nicholson said it would be hard to see how people could object to 4 apartments when there are a number of multifamily homes in the immediate area. At a past EDC workshop, Nicholson had helped brainstorm a similar mixed-use project for the corner. His idea for the project had included bringing zoning changes and/or a real estate investment to Town Meeting voters. The board scheduled the continued hearing for 8:00 pm on September 19th. For more context, I included some shots of the area in question. It starts with how the lot looked before the recent cleanup effort, how it looks now, and views nearby. *Robidoux said the project fell specifically under zoning code 174-8.4B(3) and 174-8.4B(4). That appears to be based on the assumption that the first floor would be office space. The application refers to commercial/office with documents describing the first floor to be used for “multi-tenant retail/office space”. Retail uses appear to also be covered under sections of 174-8.4B(1) and 174-8.4C(11). If you are still wondering about mixed-use, you can find the ZBA’s authority to grant permits under 174-8(C)2. This has been talked about since the 2008 master plan and now we are finally able to potentially do this, which overwhelmingly is supported by the EDC survey as well. The objections from the nearby businesses seem to be a stretch, particularly in regards to Main St. “going up”. If anything, this will be a boon the abutting businesses. I am a resident strongly in favor of Peter Bemis’s proposal. I doubt 4 apartments and new business there is going to appreciably increase traffic at that intersection. I look forward to hopefully seeing this go forward and I encourage the many many others to be focal about it as well so this doesn’t get bogged down by the strongly vocal minority that won’t support this or don’t support touching that area in any way. Very happy to see that corner being developed (and btw I live nearby). Are they seriously worried about buildings in town building “up”….Mauro’s with a hotel on top…S’boro House of Pizza with a couple of apartments….maybe the building with the bank and the preschool, though….you never know. I also think it may slow down the traffic. Maybe more unexpected police presence watching for full stops will help that issue. Just hoping that the building has some nice design qualities and not just a box. Sudbury has done some nice building designs to keep with the look they like – ex. Dunkin Donuts on 20. I can not see how someone could object to this development. What is there right now is a complete eye sore. How could Mauro’s object to this? The market that they previously owned is 2 stories. Nobody objects to the project. It needs a use variance which can be obtained at town meeting. EDC wants this as a special permit so as they move down the street and try to put in hundreds of apartments/condos on mixed use that they can bypass the citizens. It’s a setup for a larger picture for sure. Never never rely on edc, zba or town counsel. Neighbors need to appeal a special permit if granted and force them through the right process. We don’t want Southboro to turn into Marlboro or Framingham thanks but no thanks to the zba appointed developers and edc development backers!!!! The merits of this proposal are uncontested, in so far as (1) the proposed mix of uses, and (2) the site and building designs … are both deemed appropriate by other technical boards. The proposal meets all local planning goals and the master plan. The applicant proved that the design is historically appropriate (a 2 1/2 floor building stood on that site). The drainage and septic issues have already been permitted by other boards. (Con Com and Bd of Health). The Economic Development Committee has determined it will help to rejuvenate our historic town center, and remove a 20 year blight. So what, exactly, are opponents objecting to? Are their objections appropriate? The main objections concern the technical interpretation of what uses are allowed under the Zoning Bylaw, specifically residential units in a Village Business District. . But who has proper authority to decide this matter? It is the Building Commissioner. He has given his interpretation, saying the application is technically proper. He provides an example of non-transient rental housing units in Southborough … They are located next to Owen O’Leary’s pub in Rte 9. (“Non-transient” means long term occupancy, over 30 days). Those persons interested can watch the Commissioner speak at the meeting, on YouTube. (Type into Search: “Southborough Access Media”. Then scroll to: ZBA meeting, Aug 29). The ZBA’s role here is limited to consideration of whether the proposed mix of uses is appropriate, and, IF they determine the mix is good, THEN the ZBA can issue a Special Permit. That is, unless the ZBA wants to over-turn the Commissioner’s decision and question his authority … Which would introduce another thorny legal issue. Residents need have no fear of improper decisions by the ZBA. It is now professionalized, and it’s decision procedure is correct … Which is: To ask Town Counsel, up front, if he agrees with the Building Commissioner , and put his interpretation in writing, before any decisions are made by the ZBA. The real problem here is wording in our Zoning Bylaw. Those persons who don’t agree with the Comissioner’ s interpretation, claim the Zoning Bylaw is unclear. Correct. However, this is what happens when the town fails to update it’s Zoning Bylaw. It does NOT mean that the Commissioner is wrong. NOR does it mean that the proposal is improper. It simply means that the Zoning Bylaw should be clarified. Notably, those persons objecting to the Commissioner’s interpretation … said they AGREE with the merits of the proposal. Essentially, they like it, but say it should be rejected, and put on hold until someone has updated the Zoning Bylaw, to clarify this specific issue. Well, don’t hold your breath. Updating Zoning takes much technical work, and political agreement, and public hearings, and ultimately a 2/3 rds vote at Town Meeting. This site has been vacant over 20 years. It has taken that long to find an economically viable project, and one which meets our LOCAL needs. Bear in mind, please, that the owner could easily have sold this site to a fast food franchise, because that use is a permitted use. But is that what we want to happen? It can’t be overstated enough how easily Mr. Bemis could dump this to a franchise. It would be a shame to see a Dunkins or anything else along those lines go in there. There are things that could go there that could be very damaging to local businesses and those entities surely don’t care about the opinions posted here. If the current businesses are so worried about what may come in and offer competition, they should start by looking at what they currently offer. Southborough House of Pizza is dirty. They have people who come in and walk behind the counter, make lunch and don’t even wash their hands. They are also very expensive for low quality food. Mauro’s Cafe or the Spa whatever it is currently called has an owner who openly eats while making food. I have watched him repeatedly. I observed him making super bowl platters and it was one piece for the platter, one for his mouth. GROSS! Not to mention, the Board of Health regulations would be against that. However, our BOH does nothing so it seems to be allowed and accepted. Mauro’s is also another situation where the facility is not very clean. It still shocks me that the bathroom in that place is how it is. Why are patrons allowed to walk through the food prep area. Odd. We as townspeople would love to have a nice little place to walk to and grab a snack, ice cream or sandwich that won’t make us sick. Peter Bemis is a great upstanding guy, I have known him for years. He has lived in town as long as I can remember (27+ years) and I doubt he has any malicious thoughts of ruining the downtown asthetic, as that may be! Finally we have a chance to get that spot looking good and there is a group who start in against it immediately. Sometimes this town is ridiculous! That said, it certainly would be nice to see something on this corner, but we should be careful not to bring too much business to our tiny downtown. We must be certain that what goes in there will be sustainable. I have watched the spa/cafe become revitalized through many years of hard work. I know that the HOP is very busy at noontime, however it is not much in the evening, thus not a disturbance to the sleeping neighborhood. Please remember this is a residential neighborhood. We are not a metro. Many choose to live in Southborough because we want to live in a quiet, bedroom town. The residents of the village area are equally entitled to peaceful evenings as those who live in other neighborhoods. There’re centuries of precedent for a vital downtown. See https://southboroughhistory.org/?p=2465. Oh, and just to be very clear, I am not against something happening on the corner is question. I would just like to be sure that the fact that our village area is a residential neighborhood is not forgotten or overlooked. Revitalize-I love it! It’s code for over population, strain on infrastructure, strip malls, apartments and never mind the end of your school system and property values. Look at Hopkinton-You don’t have to see very far past Legacy Farms and how that is going to kill their school rankings and has already hurt their property values. It’s not as obvious in a record market, but it will be especially when it drops. Mr.Bemis seems like a smart businessman who saw an opportunity where others saw nothing but problems. From all accounts, he seems to have a reputation as an honorable person. Hats off to him for taking the risk to buy this property. 1) This development sits on the site of a former gas station that leaked gas into the underground. Don’t believe that? Just ask anyone who ever worked al Lamy’s Pharmacy across the street, or at the Barber Shop. At Lamy’s, they had to leave the basement windows open to clear out the smell of gasoline. And this property abuts a small stream next to the railroad tracks and that stream feeds into the reservoir. So how did the Conservation Commission and the Board of Health give the OK for this project to go ahead? Don’t downplay the significance of their concern! And the Mauro’s don’t live in town anymore so if Mr. Bemis gets the OK to build a 2.5 story building, rest assured that Mauro’s and the other businesses will do the same. 4) This project came before the ZBA when many residents are away for vacation. I hope the residents get caught up with this project and voice their opinions. On another note, what is up with the awful looking liquor store that also sells lottery tickets in the old Mauro’s location? it reminds me of Rt 135 in Framingham near the train station! So much for historic and scenic downtown Southborough. It’s interesting that you complain about the liquor and lottery tickets and comparing it to Rt 135 and how awful that is, but object to putting something in that would be tastefully done? I would take the time to read their application which should answer some of your questions, including that Conservation signed off as well as the steps they need to take to address the past contamination of the land. Keep in mind this isn’t a former uranium mine, I am sure after all this time we can find a way to positively and tastefully develop that lot while dealing with past contaminants. The renovated Mauro’s Market is so much nicer and more inviting than the decrepit store that it used to be. It’s really much better. Disband the EDC. The town does not need them. The taxpayers do not need to pay for this. Costly. Exceedingly disrespectful of the public, both in process and in person (even to town officials!). Some of these members should be outright removed. Behind doors meetings on their own, out of the public eye, but stating they represent the EDC. Conflict of interest forms completed after the fact. REMOVE THEM! This is unacceptable behavior for any town. Your concerns are valid, and were answered at the meeting. You are correct that there was pollution, but it was cleaned up many years ago, and inspected. It us now clean. The proposed height at 2 1/2 floors is allowed by right. No special permit for the height is needed. It is the height of the three houses abutting . They have the normal 2 floors under a sloping roof. Also, that is what was previously on this site in the early 20th c.
A sketch of the proposed building was shown at the meeting. Traditional new england design. You can see all this on the video, on YouTube. Beth, thanks for the links above to the Special Permit Application Form to the ZBA for 2 East Main Street. However, this is really confusing. 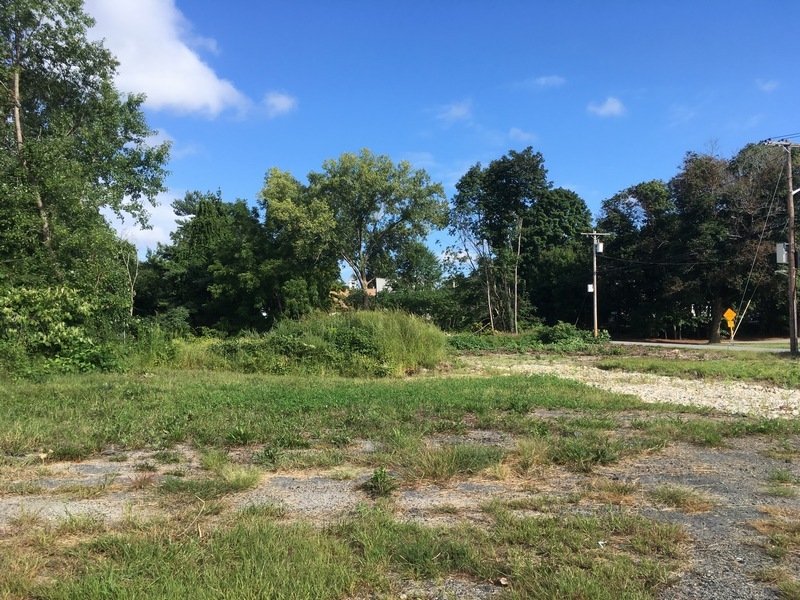 How is it that the current owner listed on the Application for 2 East Main Street, “Southborough Crossing, LLC,” listed on the application posted via your link above and following – does not exist? See the link below this Application Link. How is it that the Application shows this entity as the owner if it does not exist in the state’s eyes? According to the application, another entity “Watershed Investment Corp.” is buying the property? According to the state’s link, Mr. Bemis is the President and Treasurer etc. of that entity. Who at the ZBA level inspects the application? As they say in show business, there’s no business like no business like no business I know. . .” Whose responsibility is it to get to the bottom of this? What am I not understanding here?? When looking up who is the owner of this property on the Registry of Deeds, one can see THREE (3) extension permits granted by the Town (12-15-10, 5-1-15, and 4-19-17) not to mention THREE (3) TAX TAKINGS by the town (10-14-10, 9-20-2012, and 10-24-13). WE ALL WANT THAT SWEET DEAL !! WHO IN TOWN GOVERNMENT IS ORDERING (??) OR GIVING AUTHORITY (??) TO THE COLLECTOR TREASURER TO NOT COLLECT THE TAXES ON THIS PROPERTY? WHO IS RESPONSIBLE FOR LOOKING INTO THIS AND PROVIDING ANSWERS TO THE TAXPAYING CITIZENS OF THIS FINE TOWN??? The taxpaying public deserves to know the answers to these questions at the next BOS and ZBA meetings, the next public meetings, before one more meeting on this property. Is there an application to fill out for this process of NOT PAYING TAXES??? Would like to see the paperwork on this one! How do we get an application and that deal? Where is the PUBLIC disclosure and OVERSIGHT of NOT PAYING TAXES?? PUBLIC ACCOUNTABILITY, PLEASE. You express annoyance (about your “discoveries” regarding ownership and tax payments), which is understandable. The question is: are they valid concerns, or is there a perfectly reasonable explanation? You have put considerable time into your research, so perhaps now is the time to verify the facts. For instance, by going to Town Hall, to ask the relevant town officials for more information. Then you could follow that up with another comment here. I make this suggestion respecfully, because I appreciate the effort you have made so far, and it would be helpful to get to a factual conclusion. The downtown needs this project. Its been talked about for years. I hope some agreement can be reached. One could take exception to the following interpretation as utterly nonsensical, with no legal basis in the law. If the code is “silent,” one does NOT look to the building code. This interpretation, in my humble opinion, is a silly rope-a-dope from Robidoux. For goodness sake, get a good legal opinion and stop relying on this person who is NOT an attorney. The Building Inspector is not an attorney. The Town needs a solid legal opinion from a good attorney, with a double and triple check possibly from other attorneys. That’s how good decisions are made, based on the best possible solid legal advice. Not advice from unqualified advocates who are put in place by developers, many with conflicts of interest, who collude behind the scenes. My understanding is that Town Counsel has opined that if the units are defined as a Hotel then the matter is properly before the ZBA. But, if you want to spend a lot of our money on 2 or 3 different legal reviews by attorneys, I fear that you are more likely than not to get 2-3 (or more) different opinions. I actually feel sorry for the developer, in this case, being put through the wringer. Someone finally came up with a reasonable use for this eyesore lot and he is being treated to the Southborough anti business shuffle. Don’t be surprised if you get a 7/11 or Burger King if this get more painful. I am am working on a new post for this. It’s still in the air and the applicant has withdrawn original application without prejudice to submit new version with revised language that asks only for uses allowed in district. But it’s not as simple as you indicate. Town Counsel advised against the apartments being covered by non-transient hotels. He agreed with “Concerned Voter” that definitions aren’t under building code. He said definitions should be found in the Black’s Law Dictionary or commonly used dictionaries. Developer Peter Bemis disagreed with Counsel’s opinion and plans to continue applying to use non-transient hotels to cover residential units that he made very clear will be apartments, just not using the “A word”. He said if the board rules against it, he’ll likely take his blocks and go home, putting up a for sale sign. Some at the meeting were urging that a zoning change to allow apartments be brought to Town Meeting, believing there is strong support for this kind of mixed use project downtown. And even commenting neighbors seemed to like the idea of the project having upstairs apartments. But Bemis is wary of relying on TM, which could reject an article or amend it with restrictions that make the project unfeasible. He did indicate he may be willing to pursue that route simultaneous to getting approval from ZBA, Planning, etc. I don’t feel sorry for him at all. Let him pay his taxes in a timely manner, without the Town having to expend their resources on a possible taking for non-payment. As for possible use, the crappy, behind-the-scenes, good-ole-boy collusion has got to stop. All the legal advice in the world will not help if it comes from a biased source, one way or the other. The key to any matter is GOOD legal advice. This is why double checking with multiple sources (informally even) can be helpful. It wouldn’t make any sense to solicit a legal answer from the best source money can buy (off). Straighten out the bylaws. Get competent, unbiased legal advice. Double check it all. Isn’t this just common sense? It’s important not to let this topic die. Does the town allow developers to hold property, either vacant or not, without paying taxes on it? If so, what law permits this (if any), who is eligible by law or in practice, and when are back taxes recouped and under what terms?